Pat and I are currently visiting family in New Jersey this week, soaking up the love and beauty of the holiday season and feeling grateful for the all of the blessings in our lives! Although the holidays are about so much more than just gifts, many of us truly enjoy the process of selecting and giving presents that are thoughtful, useful, and are a reflection of our values. Today I'm feeling inspired to share some DIY holiday gift ideas which incorporate elements of the natural world . . . because pretty much everyone could use more nature in their lives! Pat and I love making wildcrafted gifts because they are an opportunity to share the beauty and bounty of the Pacific Northwest with our friends and family, many of whom live far away. These gifts are also fun to make with kiddos and offer a sweet way to deepen nature connection at home. 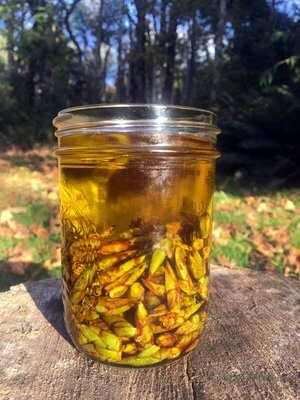 Cottonwood Salve: This healing, anti-inflammatory, and pain-relieving salve is easy to make with the buds from Black Cottonwood branches that are found on the ground after a windstorm this time of year. Check out my blog post HERE on how to make Cottonwood Salve and scroll all the way down to bottom of the post for the “Quick Method" if you're looking to make this gift in time for Christmas! Forest Bath Salts: These therapeutic and aromatic bath salts can be made with just a few simple household ingredients and some offerings from the forest! Get the recipe HERE . Rose Hip Honey: There are still some very nice looking Rose Hips out there amongst the forest edges!! Why not make some delicious Rose Hip Infused Honey?? It's jam-packed with Vitamin C! Check out our how-to on the blog HERE . Hedgerow Jelly and Fruit Leather: Yep, in addition to Rose Hips there are also some healthy Hawthorn Berries still hanging around out in the woods! Combine Rose Hips with Hawthorn Berries, apples, and sugar to make Hedgerow Jelly using the instructions HERE. Or dehydrate those same ingredients to make fruit leathers by following the method outlined HERE . -A cutting of a small log or sapling. We used Alder cuttings but feel free to use whatever you have accessible. The cutting should measure approximately 1" in length and 3-4" in diameter. Step 1: Drill various 1" deep holes in the log using the larger drill bit. Scoop the sawdust out of these holes so that they can be filled with suet. Step 2: Using the smaller drill bit, drill additional holes for perches underneath the suet holes. Knock the sawdust out of these holes. Step 3: Using garden pruners, cut small branches that fit snugly into the perch holes. Use glue or tree pitch (we use Douglas Fir pitch) to secure these branches into the holes. Cut the branches so that they're the appropriate length for birds to perch on. Step 4: With the small drill bit, drill a hole at the top of the log that goes all the way through its diameter. Feed some string through this hole and tie the ends together. This will be used to hang the feeder. Step 5: Combine the bird seed with the nut/seed butter and fill the suet holes with this mixture. Step 6: Hang the feeder in your yard and watch as all the birdies discover this generous offering! Well, there you have it friends. . . Some of my favorite easy DIY gift ideas that are inspired by the natural world. Hope enjoy making these sweet holiday presents with your kiddos!